... extending over areas of more than a million square kilometres. Flood basalts are one type of large igneous province (LIP) that characterise the Earth's surface and have been formed at various times in the geological past - some in a submarine environment and some on land (see LIP map below). Notable examples are the Siberian Traps and the Deccan Traps (trap is a Sanskrit word meaning 'step', referring to the step-like topography produced by the stacked layers of lava). The Columbia River province featured in the above photograph is minute in comparision to the size of these enormous outpourings of lava. Large igneous provinces are thought to be caused by the arrival of a mantle plume in the Earth's outermost layer, the lithosphere. The plumes are proposed to be richer in lighter elements and hotter than the surrounding mantle. As they rise, magma (liquid rock) is generated by partial melting of the plume material. The magma is injected into the lithosphere and erupted onto the Earth's surface to form huge basalt lava flows. The first few million years of a newly arrived mantle plume seem to be the most fertile in terms of magma production and flood basalts are therefore formed in a very short period of geological time. 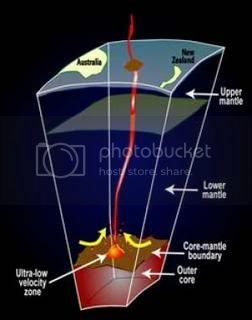 Plumes are thought to originate very deep in the Earth - perhaps at the core-mantle boundary for the larger ones and at a depth of about 600 km deep for the smaller ones - but they seem to be related to the breakup of continents (rifting), so there is some influence from global plate tectonic processes. A major uncertainty is the nature and severity of the environmental effects of the eruptions and their potential impact on life. Although the correlation between some flood basalt episodes and extinctions may implicate volcanism in the extinctions, it is also possible that other factors lead to an apparent association. Flood basalt episodes have been attributed to mantle plume activity, and thus may represent one facet of a host of related global geological factors (eg, changes in sea-floor spreading rates, rifting events, increased tectonism and volcanism, sea-level variations) that tend to be correlated, and may be associated with unusual climatic and environmental fluctuations that could lead to significant faunal changes. It has also been suggested that a coincidence of both a large impact and a flood basalt eruption might be necessary in causing severe mass extinctions. Cretaceous-Tertiary extinction, about 65 million years ago, probably caused or aggravated by impact of several-mile-wide asteroid that created the Chicxulub crater now hidden on the Yucatan Peninsula and beneath the Gulf of Mexico. Some argue for other causes, including gradual climate change or flood-like volcanic eruptions of basalt lava from India’s Deccan Traps. The extinction killed 16 percent of marine families, 47 percent of marine genera (the classification above species) and 18 percent of land vertebrate families, including the dinosaurs. End Triassic extinction, roughly 199 million to 214 million years ago, most likely caused by massive floods of lava erupting from the central Atlantic magmatic province -- an event that triggered the opening of the Atlantic Ocean. The volcanism may have led to deadly global warming. Rocks from the eruptions now are found in the eastern United States, eastern Brazil, North Africa and Spain. The death toll: 22 percent of marine families, 52 percent of marine genera. Vertebrate deaths are unclear. 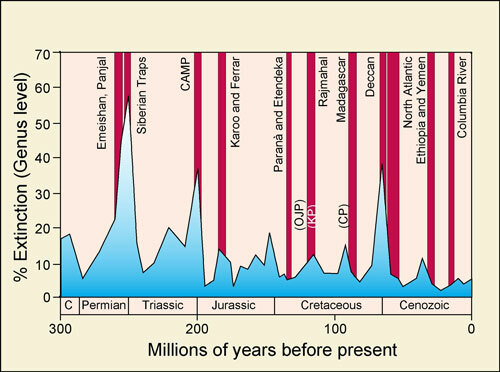 Permian-Triassic extinction, about 251 million years ago. Many scientists suspect a comet or asteroid impact, although direct evidence has not been found. Others believe the cause was flood volcanism from the Siberian Traps and related loss of oxygen in the seas. Still others believe the impact triggered the volcanism and also may have done so during the Cretaceous-Tertiary extinction. The Permian-Triassic catastrophe was Earth’s worst mass extinction, killing 95 percent of all species, 53 percent of marine families, 84 percent of marine genera and an estimated 70 percent of land species such as plants, insects and vertebrate animals.